On websites targeting users from one country may be relevant locate the server in that country. However, for websites that are targeted to users around the world, server location is not very relevant due to the possibility to set a country target in Google Webmasters Tools and due to the existence of the so-called CDNs. In addition, if the website is in several languages and has a worldwide audience, it is very important to set geotargeting for each domain, subdomain or subdirectory, and add “hreflang” attributes. Is it best to choose a server closer to my potential users or is this somewhat irrelevant? How does server location affect SEO? How do I explain to Google (and Bing) the country my website is targeting? What if my website is in several languages, is using subdirectories and is targeted to users around the world? Should I use a CDN service? How do I link different versions using hreflang attributes? Case 3: Websites that are in multiple languages (either in different domains or subdomains or subdirectories) and targeted to users around the world. What happens if my website is only in Spanish and is primarily aimed at users in Spain? Is it best to locate the website on a Spanish hosting site or can I host it anywhere? Any other relevant information included in Google My Bussiness (very important for local SEO). Therefore, if a website is hosted on a server in New York or Amsterdam, and it is directed to the public of Spain, it will be very important to set “Spain” in Google Webmaster Tools (or Bing Webmasters Tools). In short, it is not mandatory to locate the webpage on a server in Spain; it is sufficient to set international targeting in webmasters tools (If you’re using an .ES domain, this won’t be required). Now, a very important factor for Google is the webpage load speed. If users are in Spain and the website is hosted in the United States, the distance will cause a longer response time. Depending on the quality of the server, it may be more or less noticeable. For this reason, it is recommended to host the website on a Spanish server (or as close as possible to Spain). More advanced servers (and also best prices) tend to be American. This is why many webmasters around the world have their website on a North American server. It should not be forgotten that many of these American companies also have servers in other parts of the world, among which you can choose when it comes to hosting your website: Chicago, New York, Dallas, Paris, Amsterdam, Frankfurt, Singapore, Tokyo and Sydney are some of the most frequent cities in which these companies locate their international servers. Here are some examples: the American Server Siteground lets you choose between servers in Chicago, Amsterdam and Singapore; Kinsta has 14 data centers spread over 4 continents, WP Engine has 3 locations, Flywheel 5, etc. You can also find European hosting services located in other parts of the world. For example, OVH (French server) offers a choice of three locations: Roubaix or Strasbourg (in France) or Beauharnois (in the province of Quebec, in Canada). In conclusion, if a website is in Spanish and is mainly targeted to users in Spain, it is preferable to choose a good Spanish Server (with a Spanish IP) or, at least, choose a good international hosting service (either American or European) with an available data center in Europe (check this before). What happens if the website is targeted not only to users from Spain but also to users from Argentina, Mexico, Colombia, Peru or Ecuador? Do I locate my website on a Spanish server or on a Mexican server, or do I locate it on an island at an intermediate point in the Atlantic? What happens if my website is in English and is aimed at users from around the world? In all these cases, Google specifies very clearly that: “If you want to make sure that your site is not associated with a country or region specific, select Unlisted in the drop-down list”. So tick the corresponding box, search option Unlisted and save changes. Therefore, this option is than waiting for Google to unilaterally assign a geographic location. Google only lets you choose between the countries from the list; you can’t choose continents or other geographic areas (such as Latin America). In these cases server, location is irrelevant. In any case, if your website targets users around the world, it is important using a CDN service (Content Delivery Network). A CDN service works by providing alternative server nodes for users to download resources (usually static content). These nodes spread throughout the world, geographically closer to your users, therefore ensuring a faster response and download time for content, due to reduced latency. Cloudflare. Perhaps the most famous, although it is not only a CDN service. It has a free basic plan. Operates independently of the hosting provider, however, many hostings services have been concerned to taking additional measures to ensure that this service functions optimally. In fact, many servers have become partners of CloudFlare and they allow you to connect this service from cPanel facilitating the configuration. MaxCDN. It is a CDN service used by many websites, but does not have any free plan. Prices start at about 9 dollars per month, although there are some servers that offer it free of charge in some of their plans (for example, WP Hosting Spot). KeyCDN. It is a high-performance CDN, located in Switzerland. It is one of the most affordable content delivery service on the market ($0.04 / GB). They aim to make CDN services available to everyone, and expand into regions where CDN’s are typically not available (Russia, China, Australia, Singapore, Japan, France, Spain, Italy, Sweden, Netherlands, UK, USA, etc.). They support all the major content management systems (WordPress, Joomla, Drupal, Magento, etc.). It is the CDN service I’m using on this website. Like Cloudflare and MaxCDN can be integrated in WordPress with W3 Total Cache or WP Rocket. In conclusion, if your website is targeted to users around the world, server location is not the most important thing. What is important is to use a quality server and a good CDN service so that your website loads quickly regardless of the geographical location of your users. The third case would be websites that are in multiple languages (for example, in English, French, German, Japanese, Chinese and Russian) and targeted to users around the world. It is also the case of websites with different variants of a language targeted to users around the world (Spanish and Mexican Spanish or Portuguese, Brazilian Portuguese and Angolan Portuguese). What to do in these cases? Do I locate each language version on a different hosting site? Or do I locate all versions on the same server and use a CDN service? The first possibility is to locate each version on a different server: US version on an US server, English version in a United Kingdom server, French version in a French server, Spanish version on a Spanish server, Mexican version on a Mexican server, and so on. This could be a good solution if you don’t need to synchronize contents, although it is obvious that this a solution is very expensive as you have to buy different domains and hiring servers in different countries, and, of course, it is much more complicated to manage all th sites. For large companies with branches in several countries, and where each branch manages its own website, this can be a good solution, but for the vast majority of multilingual webpages around the world it is not. The second option is to locate one website with all language versions on the same server. This is the solution that the majority of multilingual websites use, due to its lower cost, easy management and the possibility to link contents. 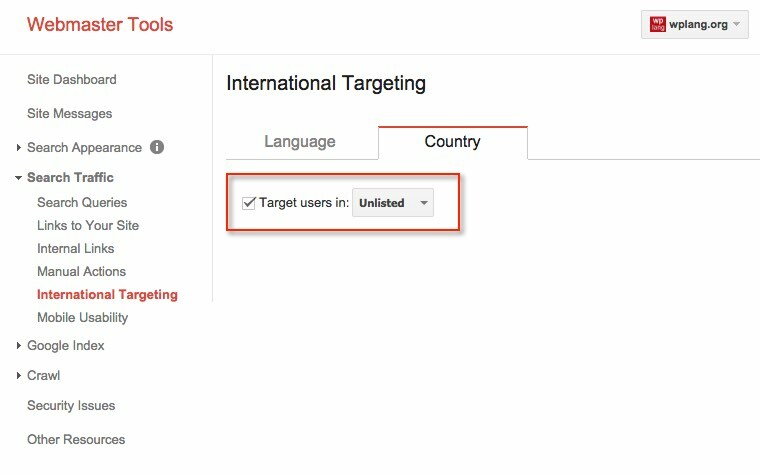 Whether you use domains, subdomains or subdirectories, you must set international targeting in Google Webmaster tools for each of them. Google not only allows you to add domains, but also subdomains or subdirectories on an individual basis. The second essential element is to interlink (or synchronize) the contents of each version adding attributes rel = “alternate” hreflang = “x”, so that if a user changes language in one article, they will be automatically redirected to the version of that article in another language (if there is a translated article available) rather than linking back to the homepage. To link search results from users of different countries with the appropriate language. Each version will also have links to other versions and vice versa. To improve the accessibility and user navigation experience so that if the user wants to change language at any moment, they simply have to choose the language option, and they can continue reading the same content in their preferred language. Sitemap. You can submit language information in a Sitemap with hreflang attributes. In any case, Google recommends to use only one of the two methods to prevent errors. In conclusion, if you have a website in multiple languages targeted to users worldwide, server location is irrelevant. What is important is to use a good hosting service and a CDN service, as well as adequately set international targeting (whether domains, subdomains or subdirectories) in Google Webmaster tools, and synchronize contents using hreflang attributes. CDN: KeyCDN service, which has servers distributed throughout the world (America, Europe, Asia and Oceania). Hreflang attributes. Inserted using HTML links in header via WordPress plugin, Multisite Language Switcher. If a website is targeted to users from one country it is better to locate the website on a good hosting site in that country or, at least, close by. This will improve website loading speed, a factor that Google increasingly takes more into account in search results. In any case, if you are using a generic top-level domain (.com, .org, .net, etc. 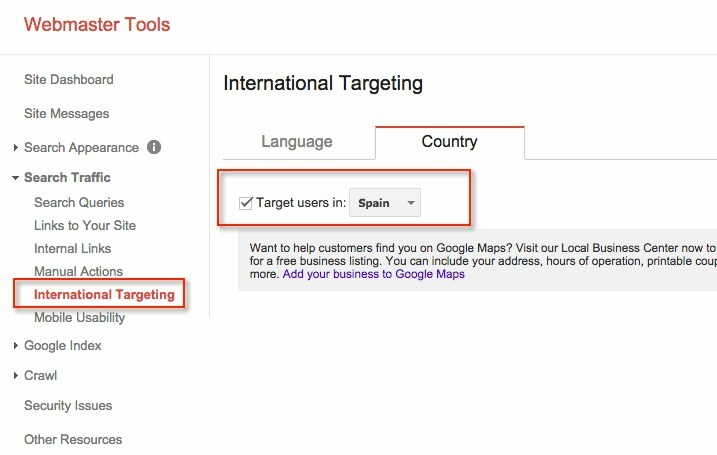 ), you should never forget to set international targeting in Google and Bing webmaster tools. If the website is targeted to users around the world, then server location is not very important. What is important, is to use a quality server and a CDN service so that the website loads quickly anywhere in the world. This will improve user experience and SEO. 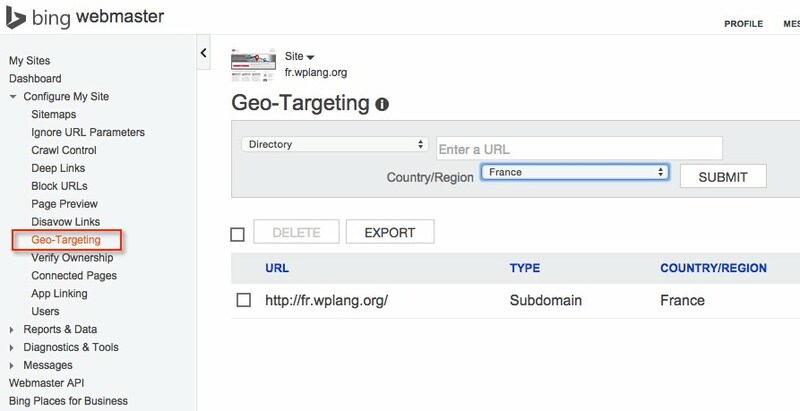 If the website is in multiple languages and targeted to users worldwide, it is very important to add each version individually (domains, subdomains or subdirectories even) to webmaster tools (to set international targeting), as well as to interlink contents of different versions using hreflang attributes. What location have you chosen and what are your reasons?